American Paint Horses were developed from spotted horses with Quarter Horse and Thoroughbred bloodlines. This combined both the conformational characteristics of a western stock horse with a pinto spotting pattern. Color patterns differentiate the American Paint Horse from other stock-type breeds. 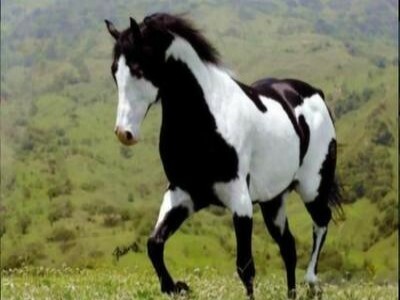 Each horse has a unique combination of white and any one of the colors of the equine rainbow: black, bay, brown, chestnut, dun, grulla, sorrel, palomino, gray or roan. The American Paint Horse Association (APHA) breed registry is now one of the largest in North America. While American Paint Horse are known for a colorful coat pattern, the registry has strict bloodline requirements and a distinctive body type. To be eligible for registry, a Paint must come from stock registered with the American Paint Horse Association, the American Quarter Horse Association, or the Jockey Club (Thoroughbreds). The result is an intelligent stock-type horse that is extraordinarily versatile, powerful and athletic with unequaled beauty. Paints are stockier and more powerfully muscled than some other light horse breeds. Though generally short-coupled, strong-boned, and well-balanced, American Paints also exhibit exceptional refinement and beauty, especially about the head and neck.